I recently shared how to evaluate a business. It's pretty awesome and helpful. Not surprisingly though, there are MANY frameworks to use when evaluating a business. 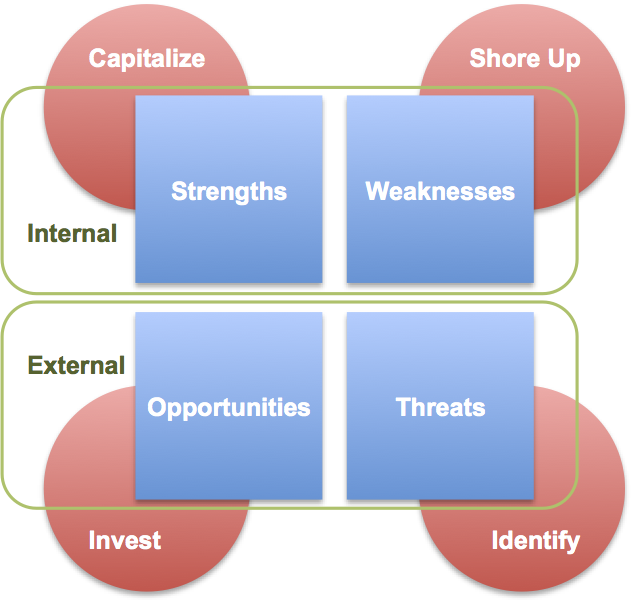 Today I'd like to review the most common/classic framework: a SWOT analysis. It's mostly used for evaluating your own business, but can also be used when looking at new companies. There are 4 parts, 2 internal, 2 external. The diagram above spells out the relationships. Do some primary research by seeking feedback from real customers and employees. Ask about the company's capabilities, about the resources (financial, human, capital, brand, etc), and how the company's processes work. Do some secondary research on the environment, industry and competitors too. Ask similar types of questions. Use this research for the basis of filling out each section of the SWOT. The next step is to do something about this new-found information. As my diagram above brilliantly displays, you create plans based around what you found. Are there opportunities that align with your strength? Are there creative ways to diminish a weakness? This is where value begins to be created. Can a solution be found with the company? Does it make sense to buy something to over come this weakness? If this isn't solved, the ride to prosperity may not last very long, or ever get off the ground. How can you use your strengths to meet the demand? Focus on doing the actives in the green area as much as possible. For example, Apple is excellent at making beautiful computers. They saw that smart phones where not living up to people's dreams. So they made a beautiful smart phone. Now 50% of their revenues come from the iPhone. The red area should keep you up at night. This is a big area of concern. Figure out ways to reduce this as much as possible. The best way is to focus on shoring up those weaknesses. For example, Google's Android phones were potentially in trouble because they were threatened by Apple lawsuits and Google had weak patent protections. One solution was to buy Motorola Mobility to shore up their patent protection. That might have been enough. The orange areas require smart decisions. 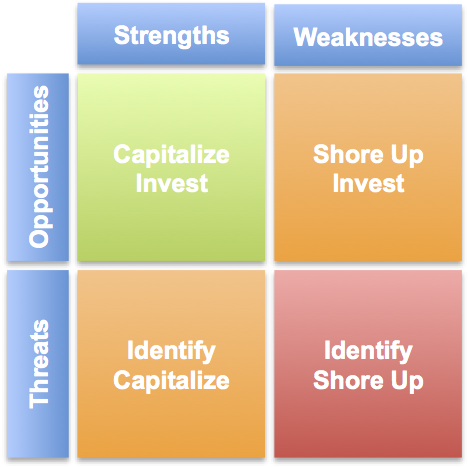 You need to invest in shoring up a weakness to take advantage of an opportunity. And, on the other square, figure out a way to have your strength be relevant again in the face of threats. So, that's how to use a SWOT analysis. I now certify you knowledgable enough to really get into trouble with this framework.